Get Premium tone right from your pedalboard. 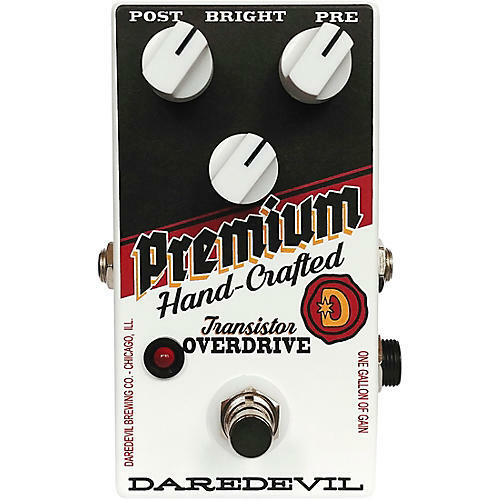 The Daredevil Pedals Premium Overdrive is a hand-wired, transistor-based overdrive. The Post knob controls the volume, Pre controls the gain, Bright control is your tone stack, adding more bite as you turn it up. The Premium sounds like a very natural amp gain. It’s open and raw, gets great feedback when cranked, and stacks very well. These are nowhere in the realm of TS overdrives, so if that’s what you want, look elsewhere. Warm and bluesy, saturated full stack, bright gain boost for solos — it’s in there. No buffers, true bypass. 9V battery or negative ground DC jack.